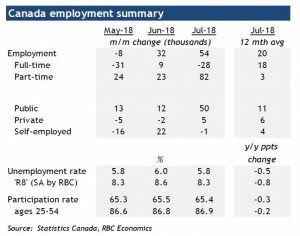 Statistics Canada announced this morning that employment increased in July and the jobless rate fell .2 percentage points to 5.8%–returning to its lowest level since the 1970s posted earlier this year. The economy added a stronger-than-expected 54,100 net new jobs last month–its most significant advance this year. This gain, however, was driven by increases in part-time work. July’s jobs surge followed the 31,800 rise in June. Both months enjoyed advances well above the 20,000 average monthly gains of the past year. In the 12 months to July, employment grew by 246,000 (+1.3%), largely reflecting growth in full-time work (+211,000 or +1.4%). Over this period, the total number of hours worked rose by 1.3%. The job growth last month was primarily in public sector jobs, especially in educational services mainly in Ontario and Quebec. At the national level, the rise was primarily in employment in post-secondary institutions, particularly universities, and was mostly in part-time work. The number of people working in health care and social assistance also rose, mainly in Ontario. In British Columbia, the number of people working increased by 11,000 and the jobless rate was 5.0% (see table below). 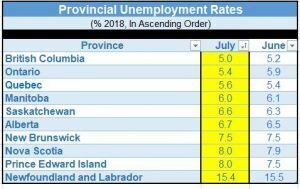 Job gains were also noted in Newfoundland and Labrador, the first increase since October 2017. The number of workers declined in Saskatchewan and Manitoba, while it was little changed in other provinces. Manufacturing jobs declined by 18,400 in contrast to the record-high jump of 90,500 in the service sector. The surge in service sector employment, however, likely reflected a technical distortion. The timing of hiring in the education sector has been volatile over the summer months in recent years causing a seasonal adjustment problem. The July spike education jobs will likely be unwound in the next two months. Wags gains slowed during the month, with average hourly wages up 3.2% y/y compared to 3.6% y/y in June. Wage gains for permanent workers were 3%, the slowest this year. The Canadian economy continues to run at a stronger pace than long-run potential as the labour markets continue to tighten. The jobless rate of 5.8% is below the full-employment level of 6.0%-to-6.5%. A more robust pace of hiring runs the risk of further increasing excess demand, putting upward pressure on inflation. In consequence, the Bank of Canada will continue to withdraw stimulus by gradually hiking overnight rates. This report has raised the likelihood of another increase in the benchmark overnight rate of 25 basis points, possibly as soon as the next policy meeting in September. Inflation, however, remains at the Bank of Canada’s target of 2.0%, allowing the Bank to wait until the subsequent meeting in October.